Fourth Row Center: Film Writings by Jason Bailey: In Theaters: "The Extra Man"
Let us consider the strange case of writer/directors Shari Springer Berman and Robert Pulcini, who made a huge splash back in 2003 with Sundance winner (and Oscar nominee) American Splendor. That film, an ingenious hybrid of biography, documentary, comic book, and general malaise, managed to be singularly unique in a particularly homogenized period of independent film; it appeared to mark the arrival of a pair of truly original voices. So everyone was more than a little confused by their 2007 follow-up, The Nanny Diaries, a film not so much bad as it was plain and forgettable. Anyone, it seemed, could have been behind this Upper West Side coming-of-age comedy/romance; there was nothing particularly distinctive to be found in it. Their new film, The Extra Man, finds the pair striving to get their offbeat groove back. Like The Nanny Diaries, it is based on a novel, but this time by quirky New York writer Jonathan Ames (creator of HBO’s Bored to Death), who collaborated with the duo on the screenplay. It is, indeed, a very literary picture, utilizing voice-over narration, fantasy flashes, and other flourishes. It is a clever movie, but not always in a positive sense; in spite of its brainy charm, you feel it not working, not quite fitting together, in spite of how much of it is skillful and entertaining. The main character is ostensibly Louis Ives (Paul Dano), but most of our attention is paid to Henry Harrison, played deliciously by Kevin Kline. Ives is an awkward young man who moves to New York City to write and reboot his life; Harrison is the community college teacher who rents him a room. The older man supplements his meager income with his nights out as an “extra man,” escorting rich older woman to social events in exchange for an evening’s food and entertainment. 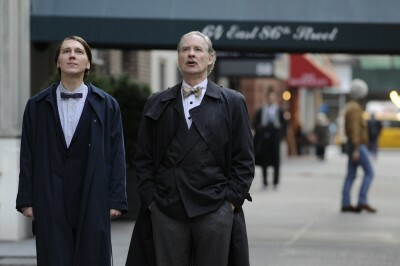 (Woody Harrleson performed a similar function in Paul Schrader’s The Walker; Kline’s character sneers, at one point, “I, however, am no mere walker.”) Louis, intrigued by this element of Harrison’s life, becomes something of an “extra man in training,” all the while juggling his crush on a work colleague (Katie Holmes) and hiding his secret desire to cross dress. The Extra Man is at its best when exploring the young squire/man of the world dynamic (one similarly well-played on Bored to Death). This has little to do with Dano’s performance—he’s doing another of his sensitive, whiny mopes, a schtick that is growing more tiresome with every passing picture. But Kevin Kline swoops into the film, at top volume and with rolling elocution, as if he’s fully aware that he’s the only compelling character in the damn thing. It’s a big, bold, theatrical piece of work, an infinitely entertaining portrait of a bombastic academic and cheerful misogynist (“The Muslims might produce another Fitzgerald. They’re very good at separating the sexes!”). But the film suffers from underdeveloped subplots (the business with his cross-dressing fetish goes nowhere slowly, and arrives at a third-act turn that hinges on the kind of split-second entrance not unknown in TV sitcoms) and overcooked supporting performances. Holmes is doing the same kind of mannered over-acting she did in Mad Money; she used to be so natural onscreen, so I was genuinely hoping that performance was a fluke. John C. Reilly is trapped in a one-joke role—he’s big and burly, with a long and scary beard, but he’s got a comically high voice—and they don’t even get the one laugh out of it. And it’s almost always a pleasure to see Dan Hedaya in a film, but he seems to have chosen to make up for his limited screen time with braying, obnoxious playing. The film’s got a great look—Terry Stacey’s cinematography is bold, bouncy, and bright—and Berman and Pulcini keep things moving at a decent clip. The screenplay is full of quotable lines (“Theatre types need to be a little homosexual, so that they can feel things more deeply”), and there’s that Kline performance, so strong and prickly (of his mentorships with his younger lodgers, he notes, “It’s my constant disapproval; some find it fatherly”). But they’re clearly going for a tone of delicate but knowing whimsy, and not quite getting there; occasional scenes nail it, but not with enough frequency or consistency. The kind of boho absurdity found in Ames’s prose is just hard to translate—it can come across in the single voice of a novelist, but here it seems sifted and diluted. For Berman and Pulcini, it’s a lukewarm accomplishment; it’s a riskier picture than The Nanny Diaries, but a far more uneven one. "The Extra Man" opens Friday, July 30th in limited release.